Amp up the fun for kids in the water with a Stearns&reg; Puddle Jumper&reg; Life Jacket. This US Coast Guard-approved life jacket can be used instead of a Type III PFD to help keep your child safe while they play in the water. The premium construction is made from durable nylon to last season after season. And with the fun character on the front, your child will never want to take off their life jacket. 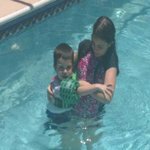 Whether they're at the pool, the beach or on a boat, your child will be able to move and swim freely, and they'll get a confidence boost if they are learning how to swim. The adjustable buckle on the back makes it easy to get your little one in and out of the life jacket, and ensures a secure fit during all the fun. Adjustable buckle snaps in back Fits children 30-50 lbs. Purchased this for my 3 year-old grandson. He loves it. His parents love it too! It is much more comfortable and, much less cumbersome that the other jacket style. He seems more confident also. He knows he is not allowed in the pool enclosure without his Puddle Jumpers on! At last minute this life jacket was purchased. Glad I did... Twice, while my child was enjoying the pool, he left the kiddies' pool and saw the need to jump into the adult's pool! As a parent, I was frightened, but he bobbed right back up! No life guard was present. I felt a level of relief and confidence in the product, BUT kept my eyes on my child. Price - worth it! Will certainly buy again. I bought two of these for my 2- and 4-year old sons and I'm very glad I did! They're adjustable so they fit perfectly and they work perfectly to keep the children afloat. They give me great peace of mind whenever my children are in the water. A must buy for all parents! Bought 2 of these floaties for my Grandsons. They love them because they can go anywhere in the pool like they were swimming. They hold them up very well and they have never complained that they are uncomfortable with them on. They are 4 and 2.